People from all over the world come to Virginia Beach on vacation and get a taste of the unique, special Dough Boy’s experience. “It’s about creating good memories,” Kotarides summarizes. “We’re not a cookie-cutter chain. We’re local. We care more because of that. We want you to have a good time and a unique experience in our town.” Over the years, Dough Boy’s has become a favorite spot for celebrations by couples, families, large groups, teams, and runners carbo-loading before the Shamrock Marathon and the Rock and Roll Half Marathon. Dough Boy’s participates in all the local surf contests and donates pizzas every year to the second oldest and longest running surf contest in the world, Virginia Beach’s very own East Coast Surfing Championships. For many reasons, Dough Boy’s is a special place. Dough Boy’s was founded in 1989 in the surf-town of Virginia Beach, VA, a sunny vacation-land that plays host to millions of visitors annually. 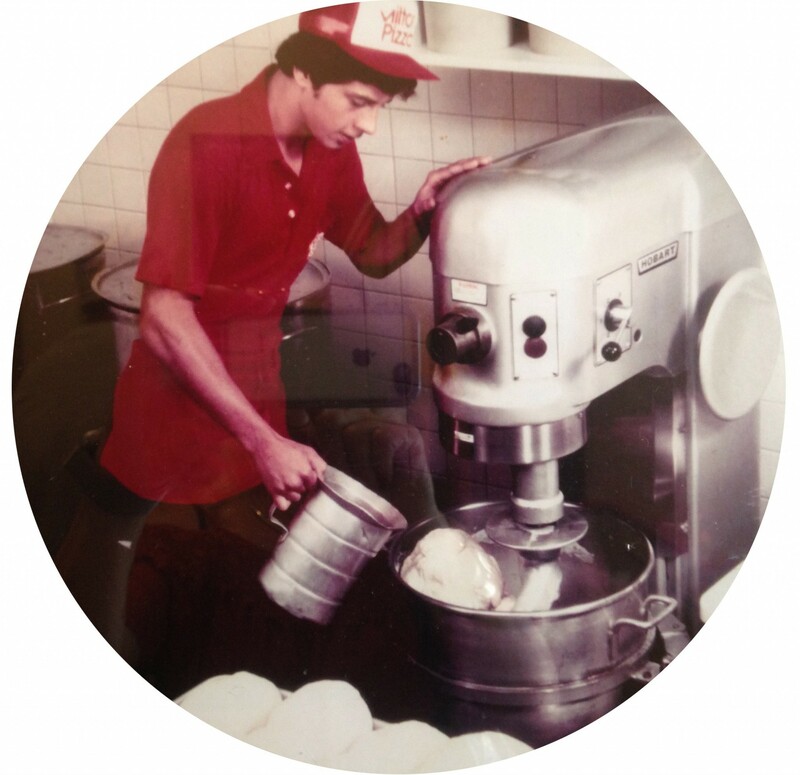 Back then there was one Dough Boy’s, located at 2410 Atlantic Avenue in the heart of the resort. By 1999, he opened a second spot at 17th Street and Atlantic Ave.
Dough Boy’s was founded in 1989 in the surf-town of Virginia Beach, VA, a sunny vacation-land that plays host to millions of visitors annually. Back then the pizza concept was called Dough Boy’s Pasta and Grill, and there was one Dough Boy’s, located at 2410 Atlantic Avenue in the heart of the resort. The fledgling operation served up a variety of pastas and “specialty pizzas,” some as crazy sounding as Oysters Rockefeller Pizza and Green Piece Pizza, as well as a wide selection of hearth baked subs, 1/2 pound burgers, salads, and unique snacks for beachcombers on the go. They even had a wine list which garnered Two Crystal Stems in the local paper. Late nights the place turned into an entertainment venue, featuring noteworthy live bands such as Buttsteak, Ant Man Bee, and Southern Culture on the Skids. Local guitar phenom, Gibb Droll, spearheaded a Tuesday Blues Night, which offered open mic opportunities for various up-and-coming blues performers. They even did dinner theater. But Dough Boy’s faced huge challenges in those early years. There was a difficult economic climate in the early 90s. The nation was in the midst of what was called an “S&L Crisis,” and banks were calling in loans on any technicality. It was in this environment, and in the aftermath of local rioting two years earlier, that important decisions had to be made at Dough Boy’s. First, financing had to be rearranged in order to survive the new cash crunch. Since those tumultuous early days, Dough Boy’s has managed to survive and grow. “It’s been super-slow, incremental growth,” Kotarides says. In 1999, he opened a second spot at 17th Street and Atlantic Ave. “It was an old seafood place called The Puritan. I walked in cold and asked the owner if he wanted to sell. Within 24 hours, we had a deal.” Ambition and money wasn’t the reason for the move, though. Kotarides explains, “I simply saw an opportunity. I’m not the proverbial hare, searching out the quick buck. I’m more the tortoise – slow, methodical. It’s kind of boring really, but as they say nowadays, it’s how I roll.” With this basic philosophy, Dough Boy’s has endured and grown for more than two decades. Now, they have a third spot in Virginia Beach on 33rd and Atlantic Avenue. People from all over the world come to Virginia Beach on vacation and get a taste of the unique, special Dough Boy’s experience. “It’s about creating good memories,” Kotarides summarizes. “Sure, we make mistakes and have days when nothing seems to go right. But, in a way, I think that makes us special. We’re not a cookie-cutter chain. We’re local. We care more because of that. We want you to have a good time and a unique experience in our town.” Over the years, Dough Boy’s has become a favorite spot for celebrations by couples, families, large groups, teams, and runners carbo-loading before the Shamrock Marathon and the Rock and Roll Half Marathon. 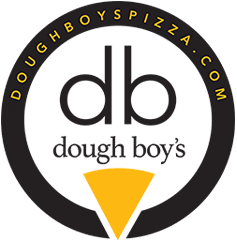 Dough Boy’s participates in all the local surf contests and donates pizzas every year to the second oldest and longest running surf contest in the world, Virginia Beach’s very own East Coast Surfing Championships. For many reasons, Dough Boy’s is a special place. It starts with great dough, of course. Kotarides adds, “We make it from scratch every day, allow it to rise naturally, and hand stretch each pie. Shoot, my office is two feet from a 60 quart dough mixer in our prep room, and I walk by the cook line to get there. I make sure every pizza is consistent, gets out fast, and tastes good.” Large pizzas are served on a pedestal. 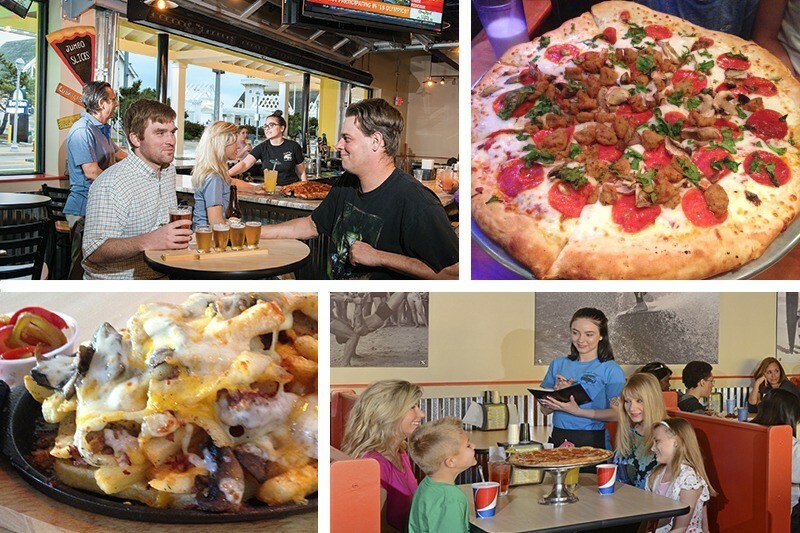 More than just your ordinary pizza place, Dough Boy’s has served unique, consistent, good food for many years. The recipe is simple. Create pizza and other specialties with the choicest ingredients. Serve them in a fun, roomy, friendly place where folks feel like they are on an “Endless Summer” vacation. Staff it with smiling, efficient personnel. Put both people and pizza on a pedestal. Sure, it seems simple enough, but no other place puts it together quite like Dough Boy’s. In basic terms, that’s the philosophy which has made Dough Boy’s truly an original. Kotarides explains why he opened Dough Boy’s newest spot on 33rd and Atlantic. “With a third location, the concept and operation had to grow, too,” states Kotarides. “We upgraded almost every aspect of the operation – gutted the dining rooms, revamped the menu, and reexamined every procedure. You can’t stay the same if you’re growing in fast changing times.” Now, if you go to Dough Boy’s, it would seem you had stepped back in time, arriving in your very own vintage VW Bus to a surf safari in 1969. Murals of iconic surf scenes surround you. A full size vintage red and white VW Bus projects into the dining room of the 24th Street location, and another full-sized Bus bursts from the outside wall over the front door of the 33rd Street location. To diners’ surprise, both have working headlights and a horn. Once in a while, the engine even starts! Of course, it’s a recording, but it sounds real!